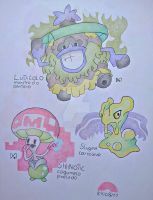 Aaah, I really hope we see the final stages for these starter variations of yours! Such a genius idea to use different typings that are weaker/stronger other than grass < fire < water. I canâ€™t wait to see the third evolution!!!! Can't wait to see the final evolution! Cool designs! My favourites are Wartortle, Ivysaur, Combusken, Prinplup and Grotle. when is the final evolution page going to come out? i've been waiting. these are so wicked cool. can't wait! I Love Your Variation of The Evolved Regional Pokemon Starters. Also, Should Braixen Be A Fire/Magician Pokemon? Because Braixen is Not a Fairy Type, Sylveon Is. I Love Fire, Magician and Fairy Type Pokemon, Though. First off, I adore the magical girl motifs that are going on for fairy!Braixen, very creative touch added on and it perfectly matches both typing and the Kalos aesthetic. Another detail I love here is how you turned the caveman-esque stomach pattern on Croconaw into a wrestling singlet. My only nitpick, however, is it's very hard to see any Ghost-type vibe going on with the Marshtomp variant, same can be said for Monferno and the added Poison-typing. But the rest of the starters hold up very nicely. Also, kudos to making Prinplup highly resemble Crasher Wake, very fitting for the region. I must ask, is there a final evolutions edition in the works or not at the moment? I feel the variant snivy would work as just a plain ice type. This is a really cool idea! Hear our cries gamefreak! I freaking adore that Ivysaur! Ack! I've been looking EVERYWHERE for you! I keep seeing these being reposted on instagram without credit and I've been telling those reposters that they need to give credit to the artist! Now I know who you are I can tell them. such awesome retypes! These are AWESOME. I'm greatly looking forward to their final forms! Anyone else getting crazy Chill Penguin vibes from the Prinplup? 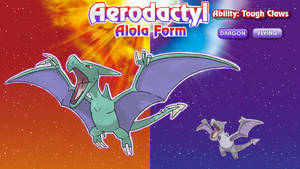 It's amazing how much different you can make these Pokemon look with a color and attributes changes. Seriously, this literally makes the possibilities for Pokemon endless!!! Ivysaur: When desperate, they will release all the magma from their body and let it cover them. The lava will then cool, forming a hard armor around them. Doing this has its drawbacks, leaving them stuck for an unknown amount of time until they can free themselves while also leaving them defenseless until they can generate more magma. Charmeleon: They can maneuver quickly in the water. When attacking opponents underwater, they will circle the foe quickly and unleash attack after attack to subdue them. Wartortle: Through repeated ramming into opponents with their heads, these Pokémon develop a coating on their head that’s comparable to steel. As such, not only is their head protected from major damage, but they can also deal more damage to a for. Bayleef: The wing on their head is a sign of how confident one is. If it’s spread out and held high, the Bayleaf is very confident, but if it’s folded back, then it’s a sign that they are more reserved. If the feathers around its neck begin to fall off, it may mean it’s in bad health. Quilava: The crystals on them change color depending on the emotions the Pokémon feels. If any part of the crystal breaks off, the gem will retain the color it had before separating. Croconaw: Their teeth are nearly invulnerable. Combined with a powerful bite make their mouths extremely dangerous. Thankfully they are actually quite docile. Grovyle: Upon evolving, it will take some time getting used to its new height and weight, eventually learning to freeze dead branches so they can better support its weight. Combusken: They move at great speeds, able to match even Rapidashes if trained enough. Despite losing their wings, they can make themselves levitate using their electrical abilities. Marshtomp: They are said to be able to communicate with the dead. It was once believed that the larger the fin on their head was, the better they could communicate, and those with larger fins were very prideful of their superior abilities. Or they just like large fins. Grotle: They are attracted to the scene of a death. There have been cases where entire packs have come to particularly horrific ones. The reason for this is unknown, many thinking they have come to collect the souls of the dead. Others however choose to look at them in a favorable light, believing they have come to guide the soul to the afterlife or to comfort the mourning. Monferno: It was once believed that were attacked by a psychic Monferno, it would place a hex on. In order to combat this, the people would seek out their attacker and bring them food until the curse was lifted. It turns out that the pain the was actually from being poisoned by the Monferno and that when the curse's end was just the poison wearing off. Prinplup: In order to prove who’s stronger, they will fire off Ice Beams into ocean to see who can attack the farthest and who can maintain it the longest. Those with farthest attack will be placed to guard the colony from distant threats. Those that can maintain it longer will be in charge of guarding the young. Servine: One should be careful when encountering one of these. Often regarded as one of the most beautiful Pokémon species, many seek it out. Those that choose to do so should be wary. They can, when threatened, attack with a lethal toxin strong enough to not only defeat an enemy but kill it. Pignite: They keep a large amount of mud clumped together in the fur of their tails, which secretes enough liquid to keep it damp. The mud has a number of uses, including to rub against them when they overheat and to attack foes if needed. Dewott: They have a strong sense of honor, never going against it even in the heat of an important battle. They would rather lose or die than break their code. Those few that do break the code of honor will be looked down upon by their kind for the rest of their life. Quilladin: Though it might not look it, the metal on their body is actually just a covering, underneath which is their normal body. Their actual skin id very sensitive and the fur they have is known for being very soft. If the metal on their body cracks or breaks off, the Pokémon will need to consume a large quantity of iron so the covering will regrow. Braixen: The fur on their tail promotes the growth of an odd flower on plants. Because of this, the twig they have has produced a flower bulb. 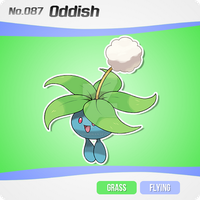 Whenever the Pokémon is using an exceptionally strong fairy type attack, the flower will bloom and then die, quickly regrowing when placed back in the tail. Frogadier: They spend most of their time next to ponds, training with other members of their specie to become and faster. In recent time, these sparing matches have become a sort of entertainment for the Pokémon in the area. Dartrix: During cold, snowy night, you may hear an eerie singing over the sound of the harsh wind. The source of the sound is of course the icy variation of Dartrix. It was once believed that this was the sound of people who were lost to the cold. Torracat: They keep sand all over their body to give them an edge in battle. Whenever they deliver a particularly quick blow or are hit hard, the sand will fly off and might hinder the foe's sight. Brionne: They tend to be quite extravagant when it comes to battling, be it dancing to attack or putting in a little too much effort making an attack look appealing. Even so, it can benefit the Pokémon sometimes, the continuous dancing allowing it to keep moving and dodge more easily and excess effort, despite using more energy, actually dealing more powerful blows. looking forward to the stage 3 evos. dudeeee this are amaziiiing, cant wait for the final evos!!! They look absolutely amazing, I found it from Pintrest and may I just say I appreciate how they aren't just color pallet swaps but actual fully designed Pokemon. I look forward to seeing your interpretation of their fully evolved form. They're so beautiful, I'm in love with that Prinplup! He looks so proud. Uwawawa! This is sooooo cooool! Kinda wish I pulled off something like this...Nice work! Are you gonna do Mega Evolutions next? Yeah, Nintendo needs to take some notes. Oh my god Pure concept is genius but your wor on it... i am spechless. Also secundary typing are so well fiting... My fav either grotle, braxien , monferno, Grovle or torracat! There is thanks to the concept of Regional Variants! When are you doing the final evos? I'm so anxious to see them!